This is why you don’t go sphinx-climbing without suction cup shoes. The Riddler has escaped Arkham (no shock there; it’s Arkham Asylum) but this time he’s going somewhat legit. Instead of committing crimes his clues are meant to lead Batman, Nightwing, and the GCPD to find other criminals. And he’s enjoying the detective work. 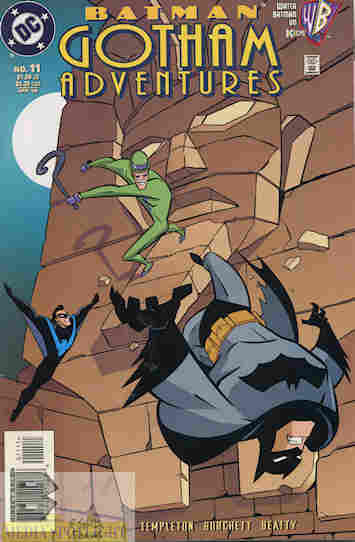 As a bonus he still gets to challenge Batman to solve his riddles without challenging him to find the Riddler. Except subconsciously that’s exactly what he’s doing and Batman and Nightwing manage to find him. Riddler decides he’s still crazy and returns to Arkham of his own free will. What they got right: The Riddler looks so happy fighting crime instead of causing it. It does feel like an evolution of the character, which DC would later do for a time in the main universe. There are also some fun moments, my favorite being Commissioner Gordon not even bothering to turn around, knowing they already left, with a nice twist on that running gag. And we see Bullock show some smarts in helping with one riddle as he joins Gordon, Batman, and Nightwing in one riddle-solving session. Nice to see Gotham cops shown as being competent. What they got wrong: This one is on the show. I hear a lot of complaints about Joker’s character model redesign but not enough about how bad the Riddler’s is. Why is he bald now? And why the Frank Gorshin-inspired onesie? For that matter in this comic he comes off a little more towards Gorshin’s take but not quite as over the top. Batman also says one line that sounds more like something Nightwing would say. Recommendation: This is one of my favorite comics from this run. You really do need to check this one out. Posted by ShadowWing Tronix on April 21, 2018 in Animation Spotlight, DC Spotlight, Television Spotlight, Yesterday's Comics and tagged Batman, Commissioner Gordon, DC animated universe, DC Comics, DCAU, Harvey Bullock, Nightwing, The Riddler.